Dig Into Gardening and Then Make Soup! You are here: Home / All categories / Dig Into Gardening and Then Make Soup! This year’s national summer reading library theme is “Dig Into Reading”. I’m excited to bring you monthly summer posts with book ideas to support the theme in conjunction with some other very talented bloggers from the Kid Blogger Network. This month we are featuring “Dig Into Gardening” books. 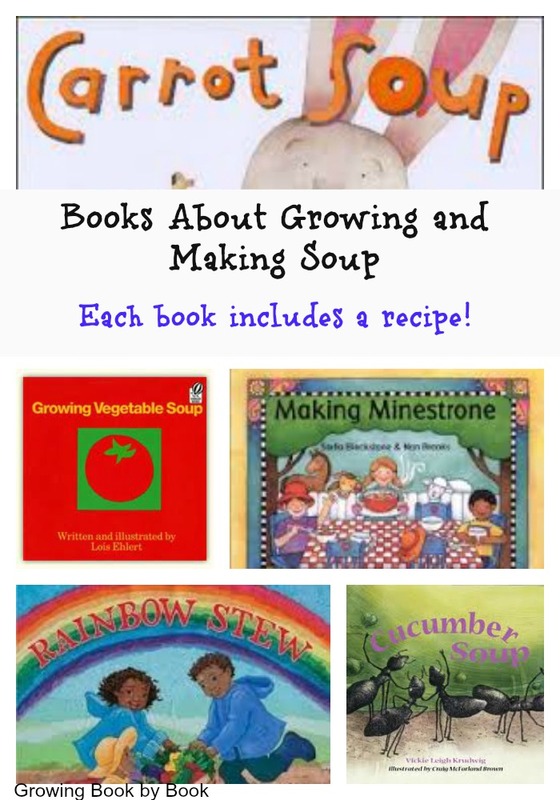 Here are four picture books centered around growing and cooking ingredients for soup! Each of the books listed includes a yummy recipe in the story. 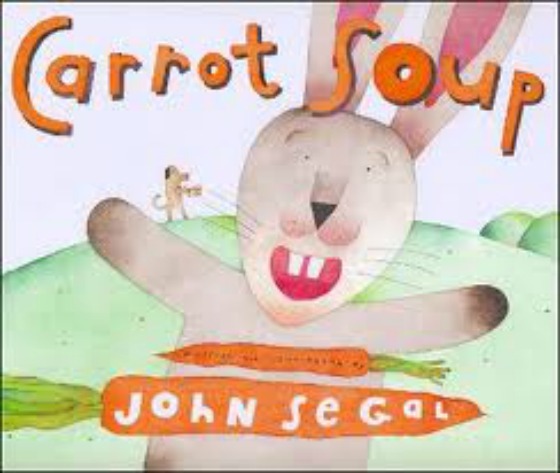 Carrot Soup by John Segal has been a favorite in our house this spring. Rabbit plants his carrots, but when he returns to harvest them, they are all gone. Little does he know that his friends have picked his carrots to create carrot soup for him. My 2 year-old is excited to plant carrots in our garden this year. Growing Vegetable Soup by Lois Ehlert shows a father and son preparing a garden full of vegetables to make vegetable soup. I love Ehlert’s illustrations and all the labels she uses within the pictures. 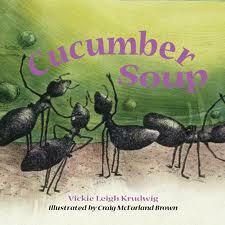 In Cucumber Soup by Vickie Leigh Krudwig, insects problem solve what to do with a fallen cucumber. This counting tale also includes factual information about each of the insects. 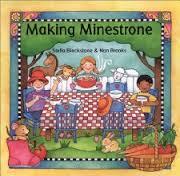 Making Minestrone by Stella Blackstone follows a group of friends as they pick the ingredients and prepare a pot of soup. 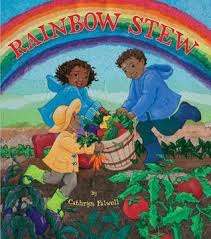 Rainbow Stew by Cathryn Falwell is the story of a family visiting their grandfather on a rainy day. The rain doesn’t keep them from picking all different colors of vegetables in the garden. They take their ingredients and make a wonderful stew to eat. Have fun reading, digging and cooking this summer. And, don’t forget to join your local library summer reading program! 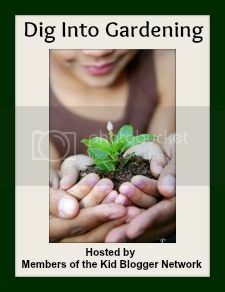 Please check out other great “Dig Into Gardening” ideas from the following bloggers. I found this article whilst looking for other information on gardening activities for my kids however I have to say, I really like this article and it has given me some great ideas for my kids in the garden (im not a great cook but think I can manage a bowl of home made soup). Thanks Carl! I like how easy soup is too! 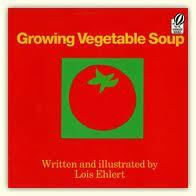 Soup books are a great way to introduce gardening to kids! Thank you for sharing this post on the Dig Into Gardening Link Up.